Exotic Car Transport | Get Free Car Shipping Quotes Now! If you are looking to transport an antique automobile or a vintage car from one point to another, consider hiring an exotic car shipping company to transport the vehicle for you. Exotic car shippers are auto transport firms that specialize in transporting expensive, high-end vehicles from one location to another. Most exotic car shippers have specialized trucks and equipment designed specifically to transport high-end automobiles safely to their destinations. Transporting an exotic car presents considerable challenges. Exotic cars are, by definition, very expensive high-end vehicles. Most cars in this category cost hundreds of thousands of dollars. An exotic vehicle could be anything from a luxury sports car, such as a Ferrari, a Bugatti or a Lamborghini, to a vintage 1960s era Chevrolet Impala, Ford Thunderbolt or Plymouth Roadrunner. In some cases, an exotic car could be a sports vehicle, a race car or even a custom-built car. Often, the owners of such vehicles are reluctant to risk damaging their cars or adding unnecessary miles to their vehicles by driving it over long distances. Exotic auto transport companies address the need of such car owners by offering specially tailored car shipping services. All exotic car transport firms use fully enclosed trucks to ship vehicles. Most of these trucks are equipped with hydraulic lift gates for loading and unloading the car from the truck. Most exotic cars have very low undercarriages. The life gates prevent damage to the undercarriage while the vehicle is being maneuvered in and out of the truck. Often exotic car transport companies use trucks with wall mounted and floor mounted ‘E’ brackets that allow the car to be strapped securely into place during transit. Many exotic vehicle shippers also use only air-ride suspension equipped trailers to transport high-end cars. Luxury vehicles, such as a Lamborghini or a Porsche, are usually wheel-strapped to such trucks to allow the vehicle to ride on its own suspension during transportation. Exotic auto transport firms usually take additional precautions to ensure the safety of vehicles during transit. For example, often such companies will use microfiber blankets and padding to cover the exterior of the vehicle, even when they are riding in an enclosed truck. Vehicle interiors and all exposed surfaces are also typically covered to minimize risk of damage. 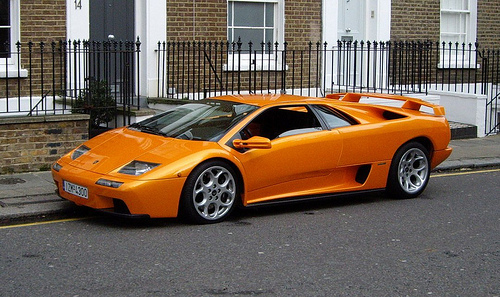 Importantly, most reputed exotic car shippers carry sufficient insurance protection to cover costs in the event a vehicle gets damaged during transit. Exotic car shipping services are considerably more expensive than standard auto shipping services, but they are usually well worth the cost.